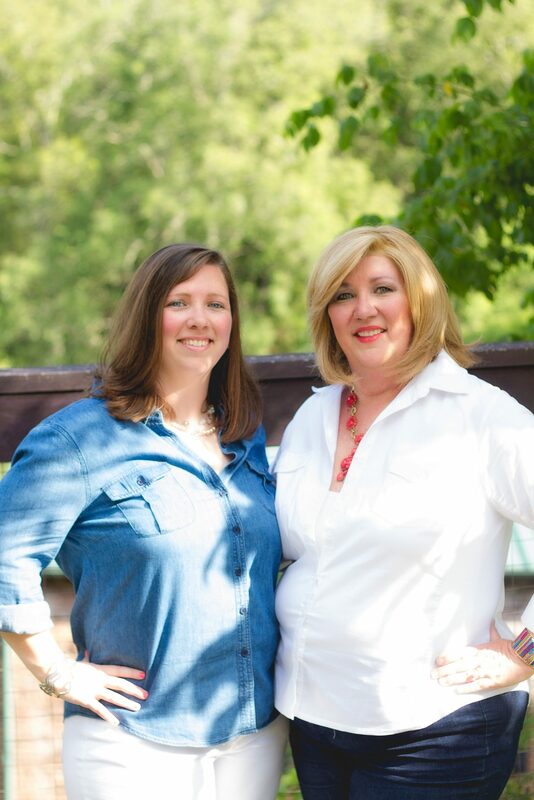 Hey y’all…I’m so glad you’re here! I have been happily preparing my house for Christmas…and houseguests, parties and entertaining. For me this really is the most wonderful time of the year. 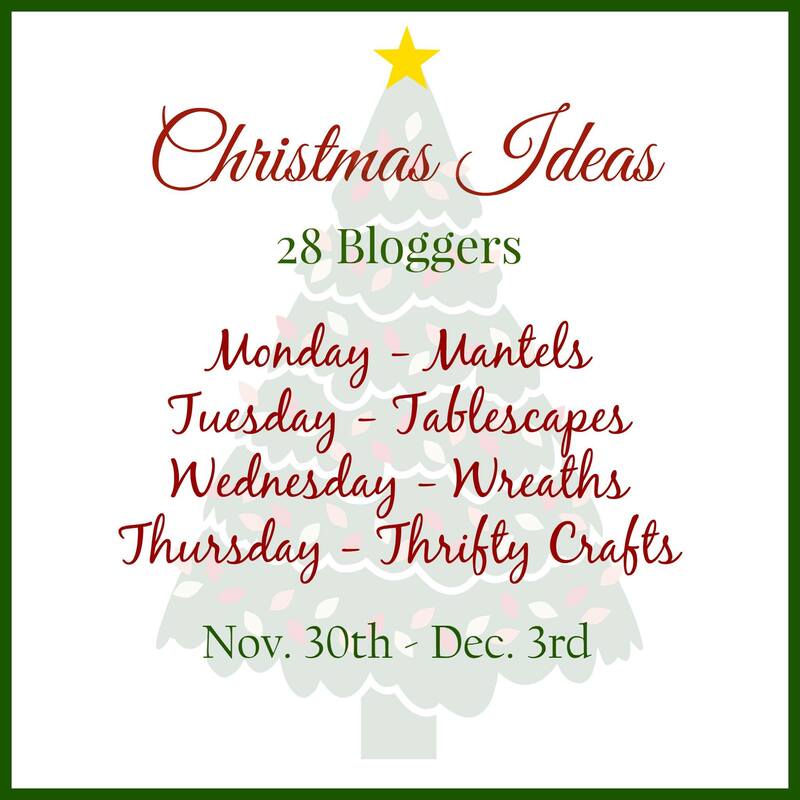 This week we have joined 27 of our blogging friends to share Christmas Ideas with you for Mantels, Tablescapes, Wreaths and Thrifty Crafts. 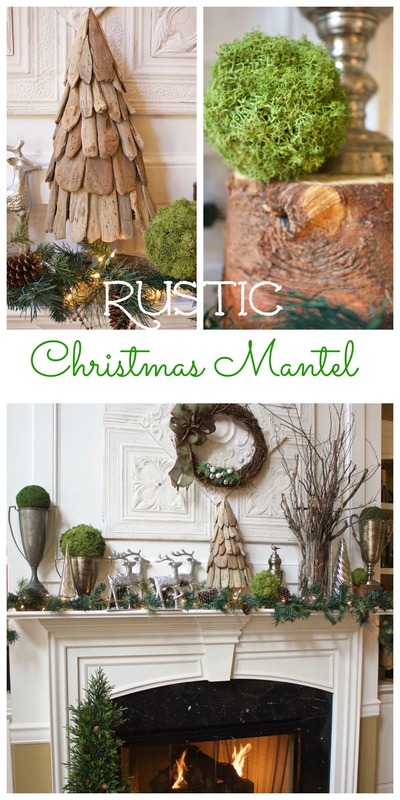 Today I am excited to share my Rustic Christmas Mantel! 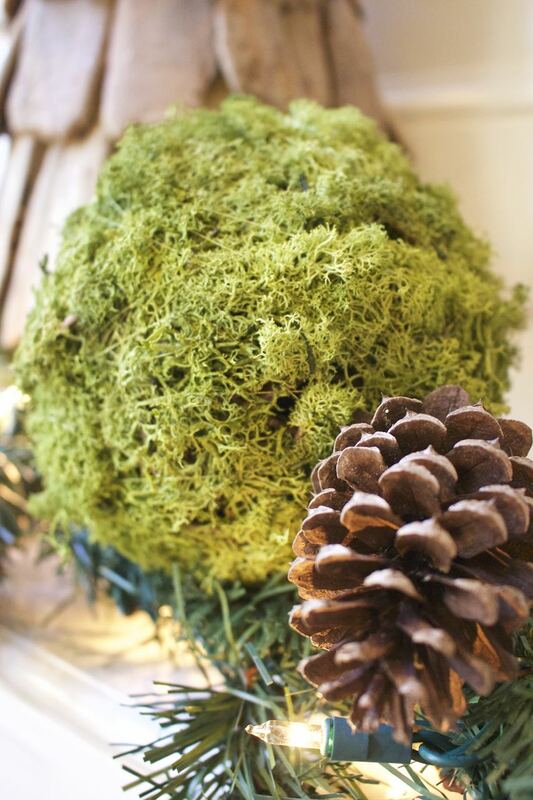 I have been very inspired this Christmas season by all things woodland and moss. I balanced the look with my favorite vintage trophies and mercury glass trees. You may remember the other day when I confessed to y’all that I collect twigs and branches. This is just part of my collection displayed in a glass vessel. 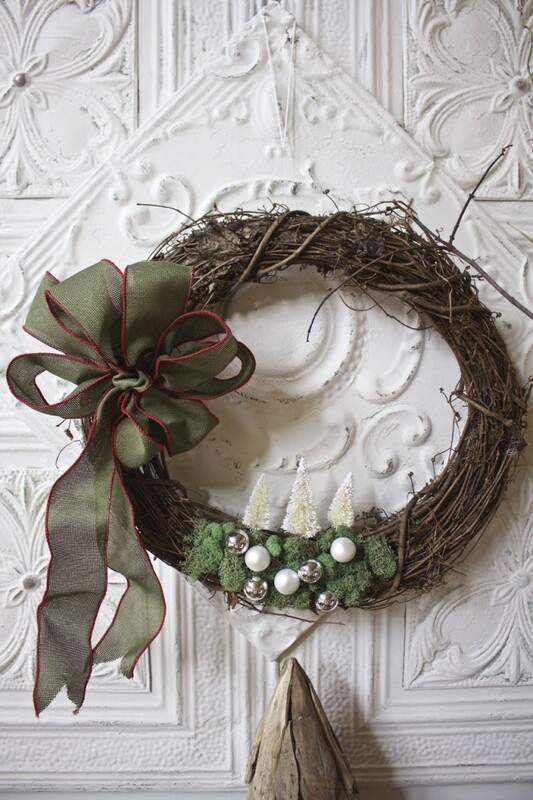 This Woodland Wreath was truly the cornerstone for my mantel decor. I think the antique tin art piece is the perfect backdrop. I’ve had these moss balls for a very long time. Every once in a while I mist them with water to keep them a little more fresh. The pinecones are another freebie from my own back yard. 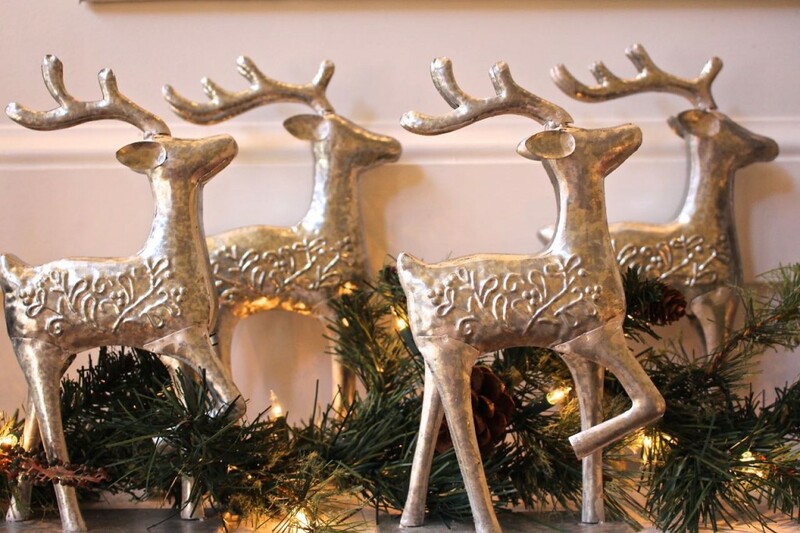 These metal deer are super cute. I bought them many years ago at Tuesday Morning (are you familiar with this store) after Christmas one year for $1 each! This driftwood tree was another serendipitous purchase. I love when that happens. I am definitely a sentimental soul. A couple of years ago we purchased the largest Christmas tree…ever in our lives. It was a beautiful 14 foot blue spruce. This large wood slice was cut from the stump of that tree. I hope you like my mantel as much as I liked decorating it! Don’t forget to visit my friends this week. You can click the links below to see more Christmas Mantels today. Merry Christmas Ladies. Nice touch on the Christmas mantel. You know I’m loving those trophies and that super cute stool! Loving the greens and the neutrals together! Thank you Darrielle…we are loving green this year. 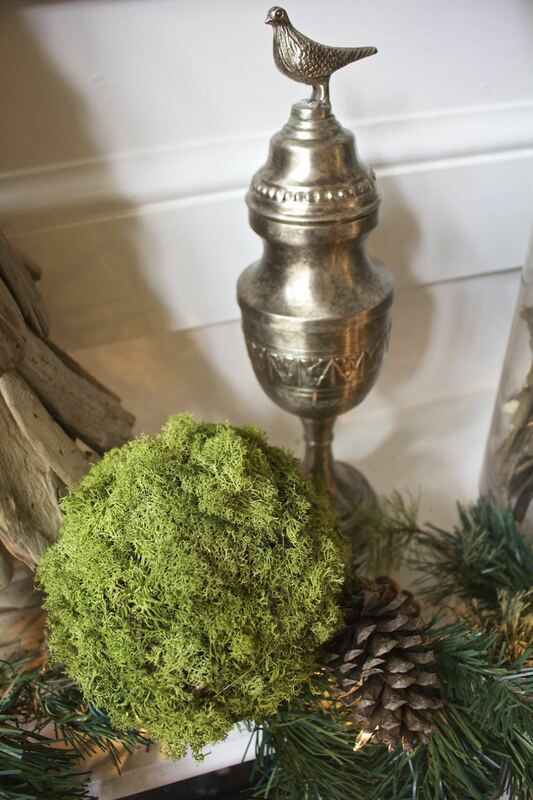 I am smitten over all the architectural pieces around your mantel and the natural touches are stunning! SO pretty!!! 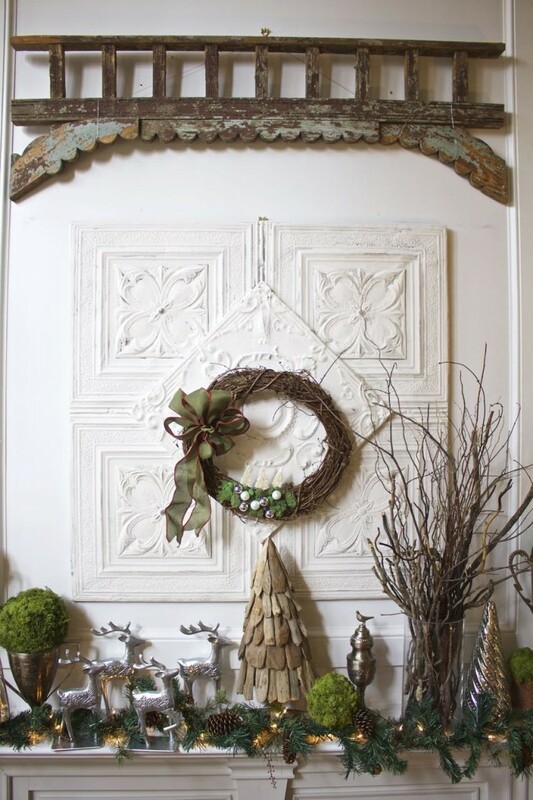 Oh my Vicki, your antique tin backdrop is stunning and perfect with your rustic Christmas Mantel, which is gorgeous by the way! Love how you mixed wood slices, trophies, greens, and mercury glass. The stool with the burlap tree is a nice touch too! I got that antique tin years ago at an antique market and have loved it ever since. Thanks for stopping by Marie! 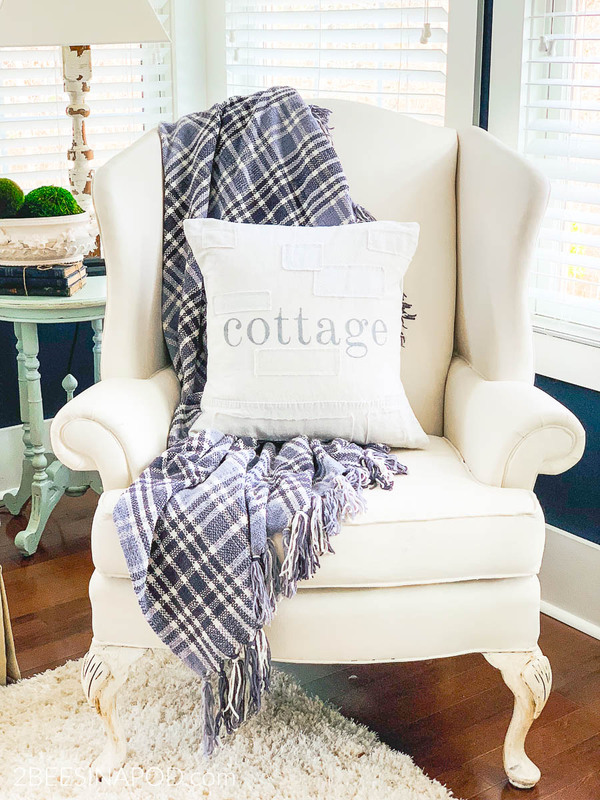 Oh what a fantastic rustic and vintage mantel….So crushing over the trophy cups….the blend so beautifully with the rustic nature of your mantel design. 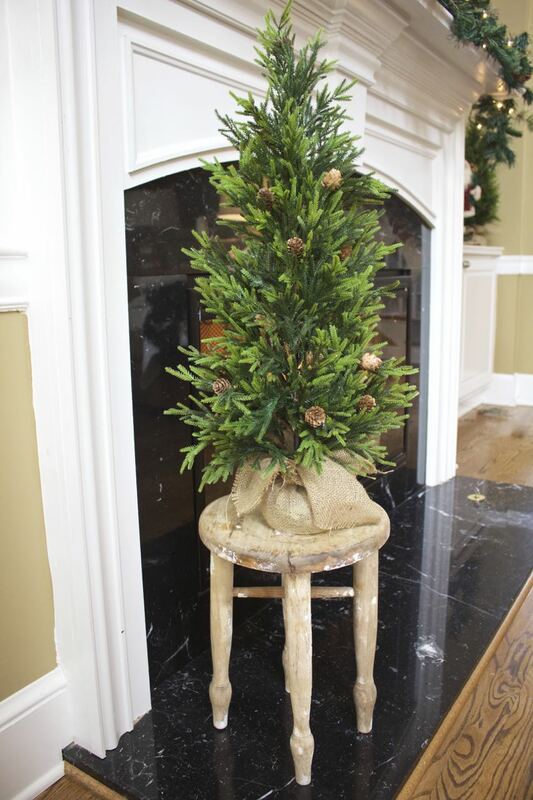 I also love how you propped the tree upon that adorable stool on the hearth….Great partying with you today! Beautiful! 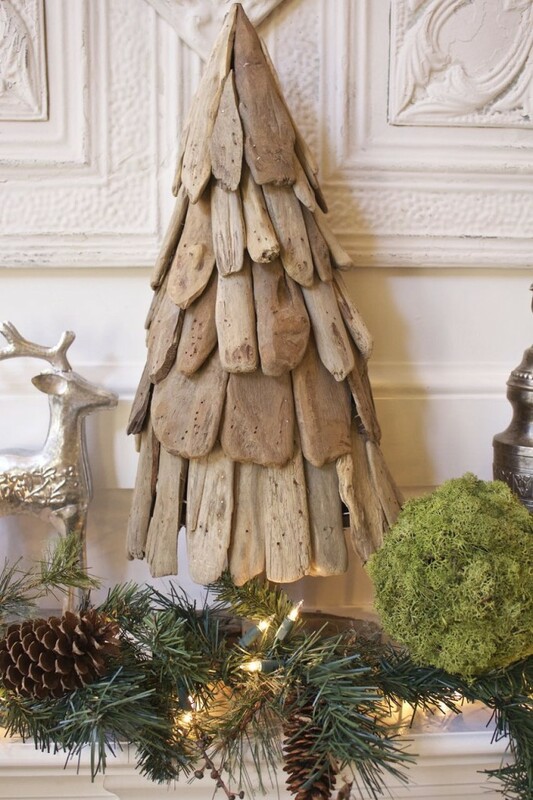 Love your driftwood tree and all the greenery! 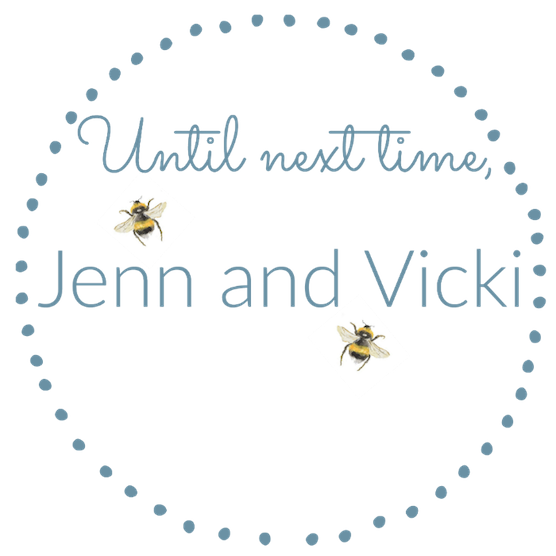 Vicki, I love how Christmas lets us bring out a few of our favorite things! That trophy is to die for! I love the combination of it all! Ahhhhhhh swooning. Love love love!!!! Gorgeous. It’s lovely! I like all the natural elements with the mix of greens and earthy tones. Well done! We’re definitely loving the earthy tones this year…thanks Sarah! 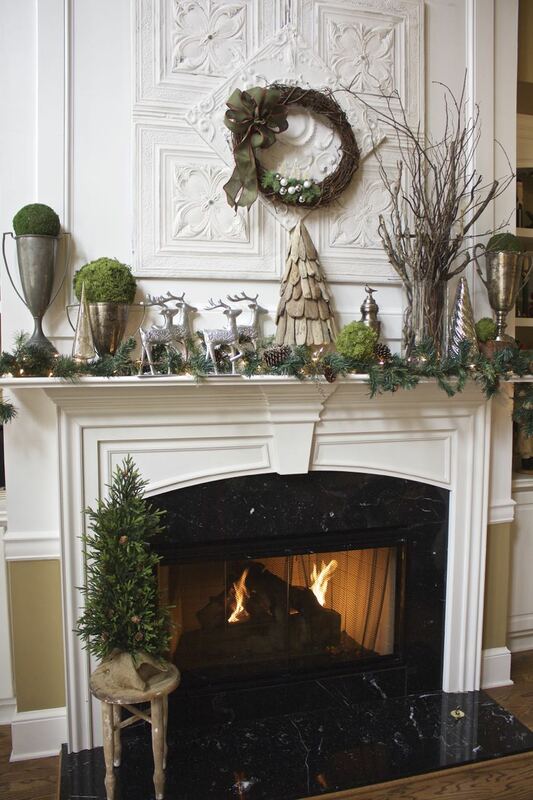 Vicki, I love, love, love your rustic mantel! There are so many details that I just adore, but now that I’ve seen your milking stool, I’m not going to be happy until I find one!!! 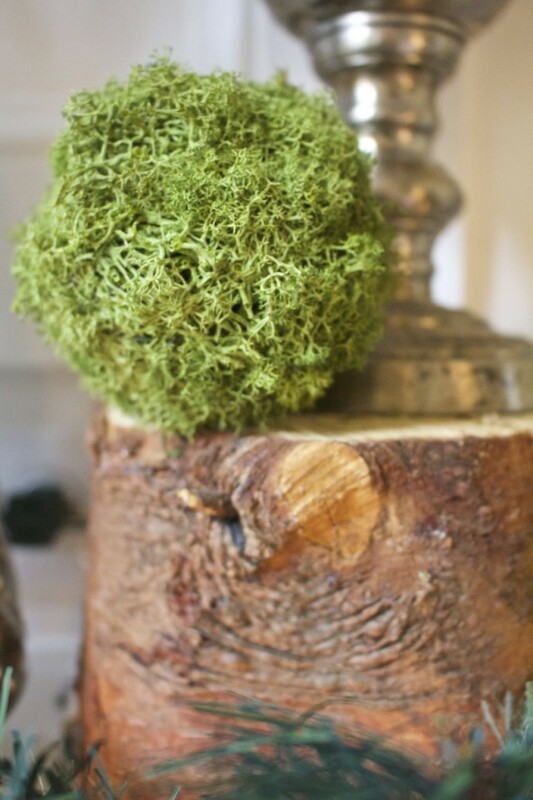 And I hate to be a dummy, but is that real moss on those balls? If so, I have plenty of it in the yard! 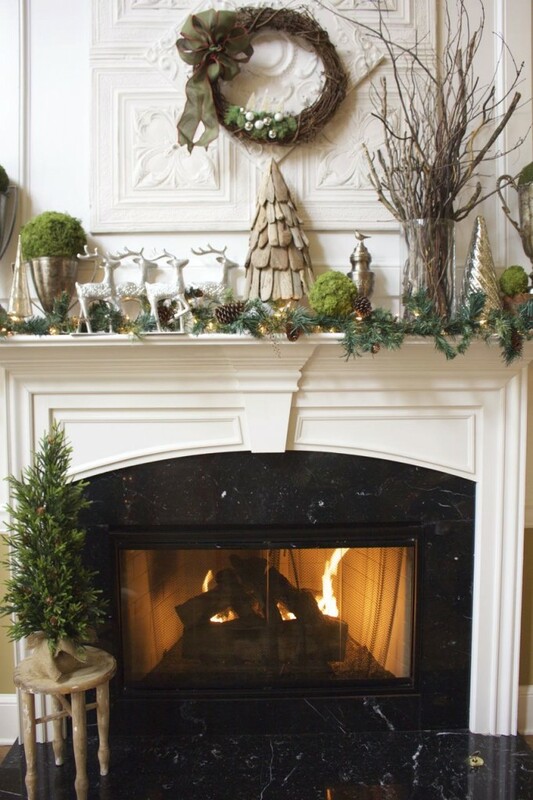 Pinning and sharing your fabulous mantel display! Thank you so much Jane! The moss is real and I got it from Hobby Lobby…we’re jealous you have so much in your yard 🙂 Good luck on your search for the milking stool. Let us know when you find one! What a beautiful mantel! 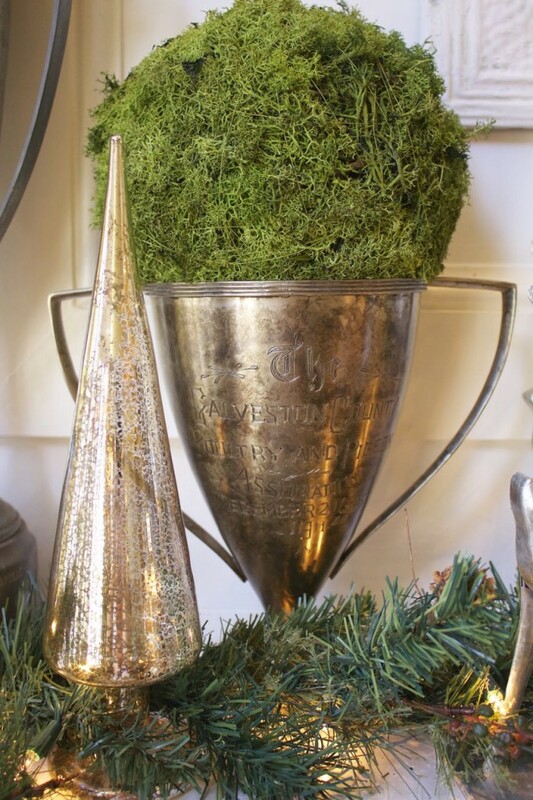 I love the architectural pieces that you’ve used and your Christmas decor is just stunning. 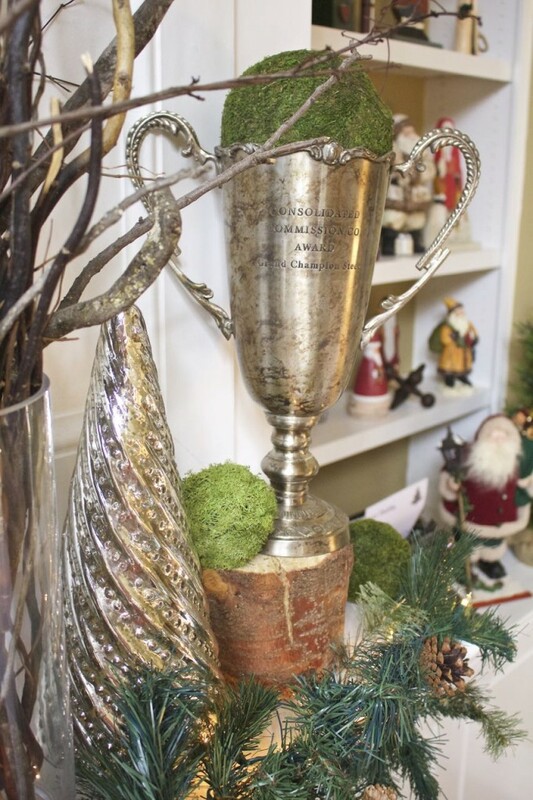 Your vintage trophy cups are real prizes and they look so nice decorated for Christmas. What a beautifully rustic mantel. Love the way how you used a lot of natural elements. That driftwood tree is fabulous! You are a girl after my own heart. It’s hard to say which part I love the best…the branches, the trophies, the sentimental stump…such treasures!!!! Aww thanks so much Kim! I try to incorporate sentimental pieces into my Christmas décor when I can. Thank you Amy! Vicki, as I read your post and looked at all the gorgeous photos, I found myself shopping. 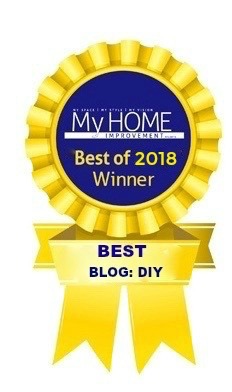 I love so many of your vintage and serendipitious finds — the trophies, the mercury glass, the antique tin art piece, the driftwood tree… It’s all so beautiful. I love your rustic mantel!! The driftwood tree and the white ceiling tile hanging on the wall are my faves but it’s all beautiful. Thanks for the inspiration!! Angie, you’re too sweet! Thanks so much! This is very pretty! With that tin backdrop you can’t go wrong. 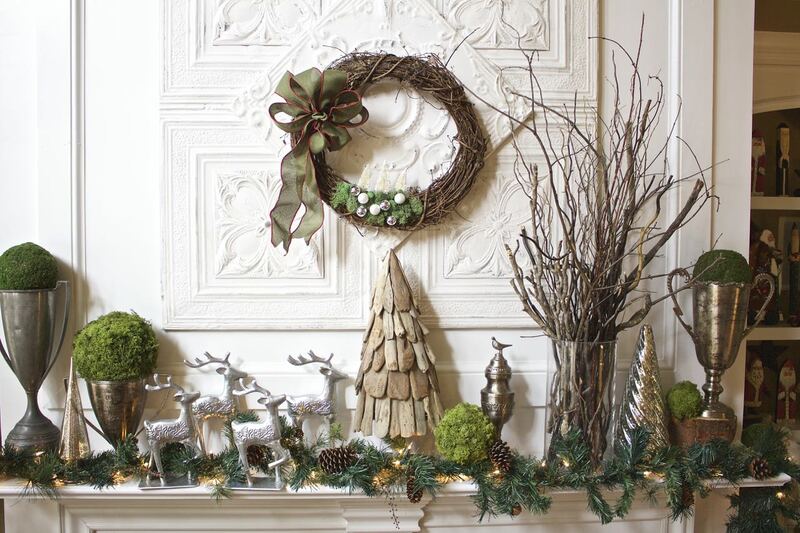 Love your mantel with the twigs and branches. The trophies fit in so well. Perfect! 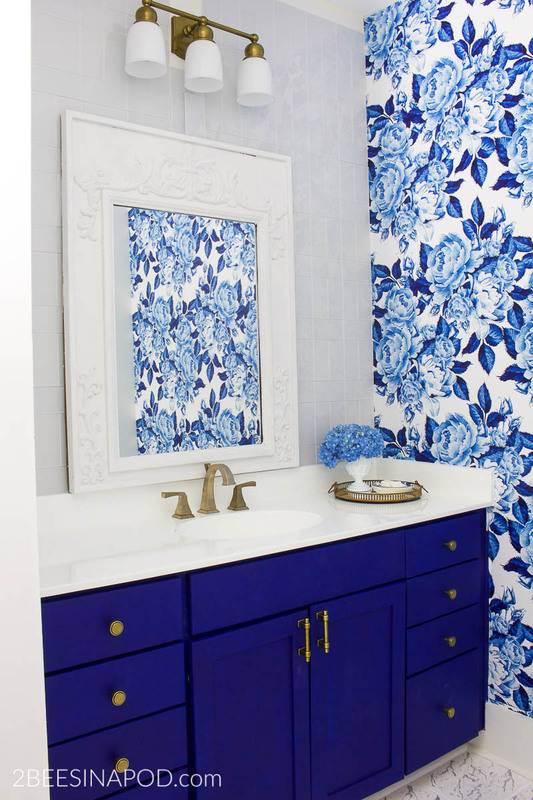 This is such a beautiful display of your collections Vicki! I love everything about it! Aww thank you so much Iris…I really appreciate it! 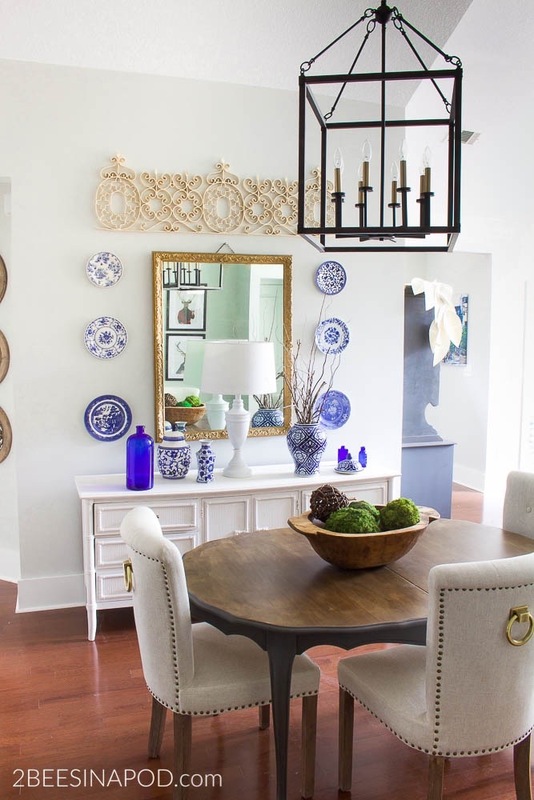 I absolutely love, love, love your mantel! The muted greens anchor everything perfectly. Now, if only I had a mantel….or a fireplace, I’d have something to copy. Gorgeous!